Scientists have recently discovered a new species of a peculiar cave-dwelling snail in one of the 20 deepest cave systems in the world, Lukina Jama–Trojama in Croatia. Dubbed Zospeum tholussum, the newly discovered species belongs to a genus of minute air-breathing land snails that have lost visual orientation and are considered to be true eutroglobionts, or exclusive cave-dwellers. 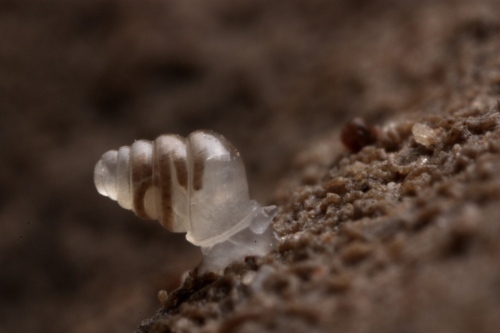 A miniature and fragile snail, it has a beautifully shaped dome-like translucent shell. Only one living specimen of the miniature and fragile snail with a beautifully shaped dome-like translucent shell was found during an expedition in the Lukina Jama–Trojama cave system. The animal was found at the remarkable depth of -980 meters (-3,215 feet), in an unnamed chamber full of rocks and sand with a small stream running through it. All known species from the cave-dwelling genus Zospeum possess a limited ability to move. Their preference of a muddy habitat and the fact that they are usually located near the drainage system of the cave, in a close proximity to running water, however suggest that these animals are not exactly immobile. Scientists hypothesize that dispersal is achieved through passive transportation via water or larger mammals. The Lukina Jama–Trojama is the deepest cave system in Croatia, extraordinary for its vertical shape, long pits and great depth of -1,392 meters (-4,566 feet). From an ecological point of view this cave system is extremely interesting for having three microclimatic layers: firstly entrance icy part with the temperature of about 1° Celcius (33.8° Fahrenheit), secondly, middle part with the temperature up to 2° Celcius (35.6° Fahrenheit) and bottom part with temperature till 4° Celcius (39.2° Fahrenheit). These unusual living conditions make the cave extremely interesting for scientist from a biodiversity point of view. The study describing the new species was published in the open access journal Subterranean Biology.